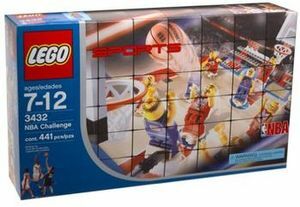 LEGO Basketball was a subtheme of Sports that ran from 2003 to 2004 with sets and to 2005 with accessories. The Basketball subtheme was originally licensed by the NBA in 2003, ending the next year. These sets were based on real games, court games, and simple street games. The minifigures in this theme were known for their special design. They have spring loaded legs and specially designed hands so players can shoot, pass and even reverse slam dunk. It took a team of four LEGO designers and six engineers a full year just to develop the arms and hands so that the minifigures could properly hold, and throw a small basketball piece. These minifigures also featured more realistic skin tones, being based on real-life NBA players from real teams. Several Basketball minifigures in The LEGO Movie.